This post comes to us from new Lost Girl contributor, Kristen Jacobson, an experienced video editor currently freelancing for a major television network. Kristen is planning to take a year-long adventure around the world, and you can read about her past adventures on Hopscotch the Globe. One of the best ways to share your travels is through a fantastically produced video full of captivating sights and sounds. In hopes of wowing your friends by doing just that, you return home and eagerly prepare your computer software and footage for editing, but something isn’t feeling right. Excitement quickly turns to panic as you realize you are restricted from creating what you had originally envisioned simply due to lack of knowledge and preparation beforehand. The following are the top 5 editing tips to help avoid this kind of disaster that I wish I knew before hitting the road. Audio grabs the attention of your viewers instantly and helps to pull emotion into the story, so poor audio can ruin a potentially great video. Simply checking the audio before and after each shot to make sure it is crisp and clear can prevent unnecessary frustration when it comes time to editing your footage. Recording ambient sound – general sounds that fill the background – no matter how faint, is also important. This will help your video’s consistency by making video transitions smoother and correcting any audio glitches. Good, quality sound should go hand in hand with good video because if one is better than the other, your viewers will focus on that instead of the actual story you are trying to tell. Even the simplest error, like forgetting to press the record button, can happen, so checking the playback of your footage is equally as important as checking the sound. Sometimes when you’re focusing on one important aspect of the shot, you forget about other details, such as the lighting, framing, white-balance and focus. Even if you think you got a great shot, forgetting to do something as simple as a white balance can be incredibly hard and time consuming to correct in editing. Sadly, you will never be able to get it to look one hundred percent natural, and this can ruin a potentially great shot that you may not be able to use any longer. B-roll refers to the secondary, or “safety”, footage that is your best friend when it comes to editing your video. This unplanned footage helps define a story, cover verbal or visual tics, and add life to interviews that may otherwise not be visually compelling. One of the most frustrating challenges encountered when editing video is realizing that you don’t have enough b-roll to develop a proper interpretation of the story you want to tell. For this reason, it is important to get more than enough b-roll, as the difference between a video with little compared to a video with a lot is incomparable. Some thought and planning should go into how your shots are composed. A well-composed shot will grab and hold your audience’s attention as well as influence their mood. Shot compositions, sizes and angles enhance how you tell your story. Understanding the power of framing can be very beneficial for the outcome of your video. 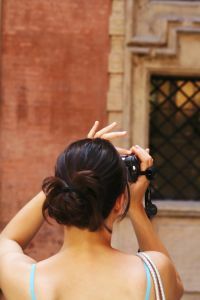 For example, a wide shot can define a location while a close-up of the same shot can create intimacy and connect the reader with the subject. In the editing stage, having a variety of shots of the same subject or place will make it easier for you to create a logical sequence for your story and help with the progression of events. A lot of travel videos consist of the traveler standing in front of the camera talking about what he or she sees and hears. As awesome as you may be, and as unique of an experience you may have had, viewers don’t want to sit there and listen to you rambling! Keep your on-camera presence to a minimum. Instead of standing in front of the camera talking about your experience, show it. Your job as an editor is to put footage together in a way that makes the viewer feels as if they are traveling with you. Use visuals and sound to make videos that capture and engage your audience. Very well written. Fun to read and clear points. Good to know information !! This is all true . Thank you for the advice, all definitely great points that make all the difference. What audio setup do you use (external audio?) and which video camera do you usually travel with? I’m looking for a camera that I can take on my next adventure – one which is not too expensive but can still capture great quality videos. Any recommendations?